Improved warning messages for Reverse Traffic Detection. It is now possible to adjust the second row temperature controls (where fitted) from the front upper screen. Improved screen for manually adding personal charging stations. 10" TS only: It is now possible to select numbers and letters on the same screen when entering destination in Navigation system. Improvements to the auto-add charge station and associated features. Touchscreen view improved with updated preferred charging station settings. It is now possible to change Bluetooth® device from the BT Audio screen and in media source selection list screen. The lower screen will now dim by the same amount as the upper screen when in stealth mode. This update introduces hotspot support for F-Types. Active Exhaust Button now available on lower touchscreen. Bluetooth® phone call connection improvements. Bluetooth® Media will now reconnect automatically after unplugging iPhone™ from the front portable media interface panel. When auto is selected, changing the distribution mode will cancel auto and the blower speed in the rotary dial will now change to its previous value. When searching for specific Points of Interest (POI) using speech, it is no longer necessary to stipulate a search area. Hybrid Charging Station filtering is now possible on PHEV vehicles. Display will now work in low power mode. Electric Vehicle (EV) button is now available on the Touchscreen (PHEV vehicles only). Creep Mode not correctly displaying in the Touchscreen. Estimated time to charge is no longer displayed unless a charging cable is connected to the vehicle. Regenerative braking state can now be selected on-screen at start up. General stability improvements – MW Band. Tuner screen – various bug fixes. ‘Reverse Traffic Detection not available’ message will no longer be displayed on touchscreen when system is active. Fixed Smartphone feature failure to launch at startup. (China only) improved robustness when switching from iPhone™ to Baidu session. (InControl Touch Duo only) CarPlay screen is not aligned with the center of the Touchscreen when launched while source selection screen displayed. Loss of audio mid-cycle when listening to Spotify with Apple CarPlay. Improved Android Auto connection strategy. Goodbye screen will no longer appear at the wrong time when the engine is switched off. Update of Speech Database using service screen – robustness improvements. SVR Logo no longer changes size during start-up. The rear screens no longer default to on at start up. The camera image is not displaying as smoothly as it should be, this is currently under investigation and should be fixed in the next full software release. Smartphone pack is for 10” MY17+ only – appears no CarPlay 8” Jaguars? iii Approved content varies depending on the smartphone’s operating system. Please check your smartphone’s technical requirements to see if they are compatible with Apple CarPlay, Android Auto or Baidu Carlife. iv You may have to select a different domain for country-specific information. Apple CarPlay compatible from iPhone 5 or later, according to manufacturer’s site. Android Auto compatible from Android 5.0 Lollipop or later, according to manufacturer’s site (as at September 2018). More native streaming services on the way! vii These functions are available for smartphones with a compatible Bluetooth profile (access to messages) and accepted access authorisation for Touch Pro. Your current InControl Touch Pro offers a range of innovative features and functions designed to make your multimedia life easier and more convenient. A fresher design, intuitive menu structures and state-of-the-art connectivity ensure a safe and pleasant driving experience. Connect your smartphone to access apps, play music through the high-quality sound system and plan the best route to your destination. The most important infotainment additions and enhancement are outlined for you below. The new and fresher design of your InControl Pro Duo user interface now features just three clearly structured main menu tiles. It contains new symbols and icons for additional functions as well as a clearer and more intuitive media player interface. The colour schemes have also been updated. A light and a dark colour scheme can currently be selected for the 10″ Touch Pro screen. With this update, the colour schemes change automatically to suit the external lighting conditions.  Check the settings to see whether “Auto” or a colour scheme that you do not want is set by default. Apple CarPlay, Android Auto and Baidu Carlife are intelligent and secure solutions allowing you to use selected content and functions on your smartphone in your vehicle.  To do so, use a cable to connect your smartphone to your vehicle’s USB connection. Your vehicle is then automatically detected (1).  You can automatically access your smartphone’s functions via the relevant menu (2).  You can switch between the connected smartphone and InControl Touch Pro’s other functions at any time (3 and 4).  The connection is also displayed in the main menu of your InControl Touch Pro (5). For further information about Apple CarPlay and Android Auto, compatible smartphones, operating systems and available apps, visit the manufacturers’ sites at www.apple.com/carplay and www.android.com/autoiv. For vehicles equipped with a mobile data connection, a range of audio streaming services are now available either via SIM card with data usage or via a Wi-Fi connection. In addition to TuneIn, which streams thousands of radio stations and podcasts from around the world, you can also use the music streaming service Deezer, provided that the vehicle has a live function. Looking for your favourite songs on your smartphone? No problem! Simply use the convenient media search function for audio devices and smartphones via Bluetooth.  The text message can be read out to the user.  The user can respond with predefined messages (selected from a list) or call the sender back.  The user can send a predefined text message to any contact in their phone book. After pressing the talk button on the steering wheel, users can voice-activate navigation guidance using simple commands. The InControl Touch Pro supports 18 languages and dialects, making it easy for anyone to navigate to a tourist attraction or a point-of-interest.  High-performance routing complete with intuitive search method and user-friendly interface.  Supports USB sticks and CDs/DVDs and displays album covers for Bluetooth audio sources.  Stable InControl apps, live apps and web browser. Additional shortcut buttons on the home screen for key functions within Navigation, Media and Phone. It’s not quite cut and dry. Customers are advised to visit their local retailer to determine if their vehicle can be retroactively updated. Not all cars are capable of being updated to accept Apple CarPlay and Android Auto. There are some technical parameters that need to be met in order to do the update – specifically a car must have 10" Touch Pro or Touch Pro Duo, with Pro Services and Connect Pro (i.e. WiFi and InControl Apps). Our vehicles are also fit with three different versions of the UIP (center armrest panel where the USB ports are located); CarPlay and Android Auto can only function on vehicles with the top two specifications of the UIP. So while that does clear up some of what’s going on – why can’t Jaguar Land Rover step up and provide a VIN decoder for MY17 & MY18 owners worldwide that can instantly show if the vehicle is compatible? This release includes a new application – ‘Activation of Smartphone Pack’. This application allows the activation of 3 smartphone integration technologies – Apple CarPlay, Android Auto and Baidu CarLife. Baidu CarLife is intended for the Chinese market only. Apple CarPlay and Android Auto availability will also depend on vehicle region. The Smartphone Pack application is only compatible with InControl Touch Pro software version 18C or later. This application will prompt users to update the InControl Touch Pro software if required. And as long as we’re here, the Land Rover USA website now lists the option, it only took a year. Is the refuel procedure on the PHEV Range Rovers the same on other PHEV vehicles? Note: Make sure that the vehicle is refuelled shortly after the refuelling button is pressed. Failure to do so may result in the fuel tank not being filled to the required level. If in doubt, check the fuel level gauge in the instrument panel before continuing the journey, to prevent running out of fuel. Plug-in Hybrid Electric Vehicles (PHEV) have a locking fuel filler flap and an isolation valve on the fuel tank. • The isolation valve on the fuel tank is open. • The fuel tank is depressurised. • The fuel filler flap is unlocked. 1. Switch off the vehicle’s ignition, apply the Electric Parking Brake (EPB), and make sure that the transmission is engaged in Park (P). 2. 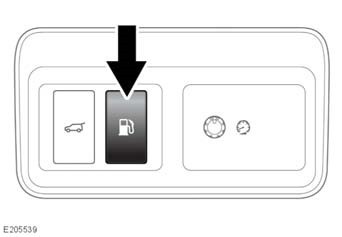 Press the refuelling button located in the lower switch panel at the driver’s side of the fascia. The isolation valve on the fuel tank opens to depressurise the fuel tank. The fuel filler flap unlocks. The instrument panel displays a message to confirm that the fuel filler flap is unlocking. 3. The instrument panel displays a message to confirm that the fuel filler flap is unlocked and the vehicle can be refuelled. See 382, FUEL FILLER FLAP. The isolation valve on the fuel tank remains open for approximately 10 minutes, at which point the valve shuts, preventing further refuelling. If further refuelling is required, repeat the above process to open the isolation valve on the fuel tank. Note: Make sure that the vehicle is stationary. The fuel filler flap does not unlock, and the isolation valve on the fuel tank does not open, if the vehicle is moving. The instrument panel displays a message to confirm that the vehicle’s speed is too high. Note: Make sure that the fuel filler flap is closed after refuelling. The instrument panel displays a message to confirm that the fuel filler flap is not fully closed. If a fault is detected on either the fuel filler flap system, or on the isolation valve system on the fuel tank, the instrument panel displays a message. In this event, consult a retailer/authorised repairer or roadside assistance. See 501, ROADSIDE ASSISTANCE. See 357, PROTECT.